Ladder maker - Output from PLC's into combined format. PullDownMenus - A sophisticated menu system that maintained critical task access for realtime applications. MatricesAnalyser - performed matrical operations on large an complex matrices, particularly useful for 'real' and 'imaginary' components of mathematical functions as required in Electrical and Electronic engineering. Barmby.BAS - a QBasic program written to be the front end for a water pumping station called Barmby. 2 OR M870 Retain ! Notice how the numbers in the left hand column correlate with the numbers shown in the pictorial representation of the same ladder rung. It was used on a number of projects for intermediate and final documentation. It is a shame in a way that a lot of my programs and ideas for programs have been superseded and made the final product superfluous nowadays. Maybe there are still low-budget PLC's out there that could benefit from this documentation system - If you know of any and would like a copy of the Basic program then I will send you a copy of the source code. A QBasic program that provided 'Pull Down' menus and 'Data Entry fields' for real time environments. Real time requires that critical tasks still get processed at all times, so the standard INPUT$ couldn't be used ( for example ). Again the usefulness of this program has been superseded by the multi-threading functionality of VBasic. This old system shows what I was up to in 1988 - I have chosen this because of it's ease to describe to the lay-person what real-time is all about. A top end written in QBasic for a pumping station called Barmby. 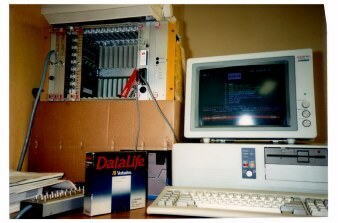 The pictures below shows the test rig, where the SATT controller ( the PLC on the left ) is provided with inputs and the QBasic program residing on the PC is extracting information from the PLC and providing a front end for the operator. The menu system as described above in the 'PullDownMenus' section was used to provide the core coding, allowing alarm monitoring and essential control to continue during data entry. Again this is old hat and the technology has been superseded, but at the time it was at the forefront of the technology. Click here if you want to see the software. 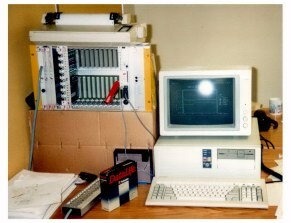 NOTE - The trend displayed on the screen in the right hand photograph - the information for this trend was sourced by the QBasic package and displayed via the QBasic package. If you are familiar with AFE then you'll recognise the similarity of the display ( with the alarms being shown at the bottom of the screen - 'Unacknowledged' ones with a red background. ).